The sesamoids are two small bones in the ball of the foot that go underneath the first metatarsal. 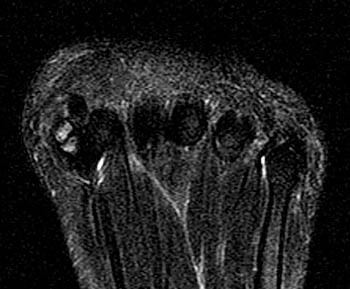 These bones are almost completely within the tendons that control the function of the big toe joint. When somebody walks, the sesamoids assist the small muscles in the ball of the foot to firmly plant the big toe on the ground. This allows us to effectively weightbear on the big toe and push off during sports and activities. Injuries to the sesamoid can be very painful and many athletes limit their running ability and even their athletic career. Sesamoid injuries are also very common in dancers because of the excess stress that is placed on the ball of the foot. They are also common in running athletes, especially a skilled position in football players because of their excessive running on the ball of the foot. Acute fractures occur as a result of an injury. There are several ligaments attached to the sesamoids and can result in injury to the sesamoid bone. There are various types of injuries that can occur with fractures to sesamoid depending on whether the injury was direct to the bone or it is a result of a pulling force applied to the bone from the attached ligament. There is a classification for sesamoid injuries that help describe the type of injury. The sesamoids can be normal in two or more pieces. These pieces are connected by cartilage. This is referred to as a synchondrosis. 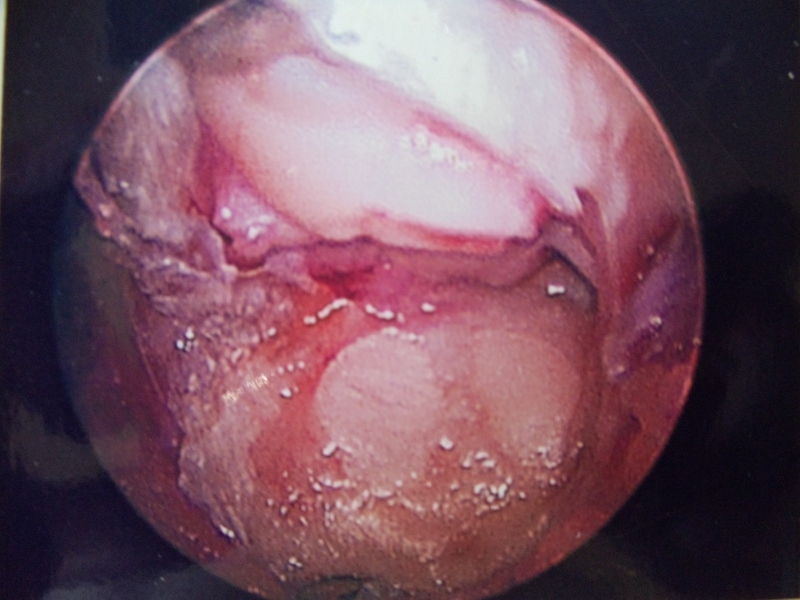 Cartilage has a very poor blood supply to the area. When an injury occurs to the synchondrosis it may appear as a fracture on an x-ray but it is not a fracture of the bone but a fracture of the cartilage connecting the bones. Injuries to the synchondrosis can be very difficult to treat. X-rays may be taken on the unaffected side to compare. However, both sides may have what appears to be sesamoids in multiple pieces. When pain persists, then an MRI may be necessary to fully evaluate the injury. 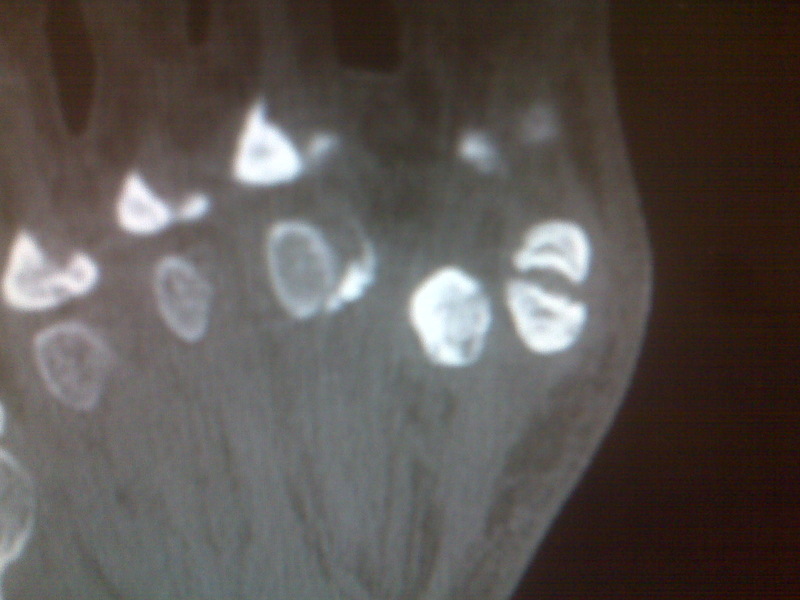 We often see bone marrow swelling on two or more bone segments, which indicates the injury to that area. Clinically, there is pinpoint tenderness to the bone on the ball of the foot. Swelling may or may not be present. There will be difficulty walking in long strides or running on the ball of the foot. Dancing can become near impossible because of the pain that patients may experience. Treatment includes immobilization in a boot and often nonweightbearing to allow the area to heal. These injuries will most often heal with conservative care but it may take many months before it goes on to complete healing. During the healing process, x-rays will not change, as the bones will not grow back together because of the cartilage that is between them. We can evaluate the healing based on the patient’s pain that they are experiencing while walking and examining them to check for tenderness. Once tenderness and pain are diminished, then an orthotic is made to go in the patient’s shoes or sneakers to unload the metatarsal further and allow the patient to return to sports and activities as desired. In some cases, these injuries do not heal and one or more of the pieces of bone on the ball of the foot needs to be removed. A small incision is placed on the inside of the first metatarsal joint and a piece of the bone is removed. 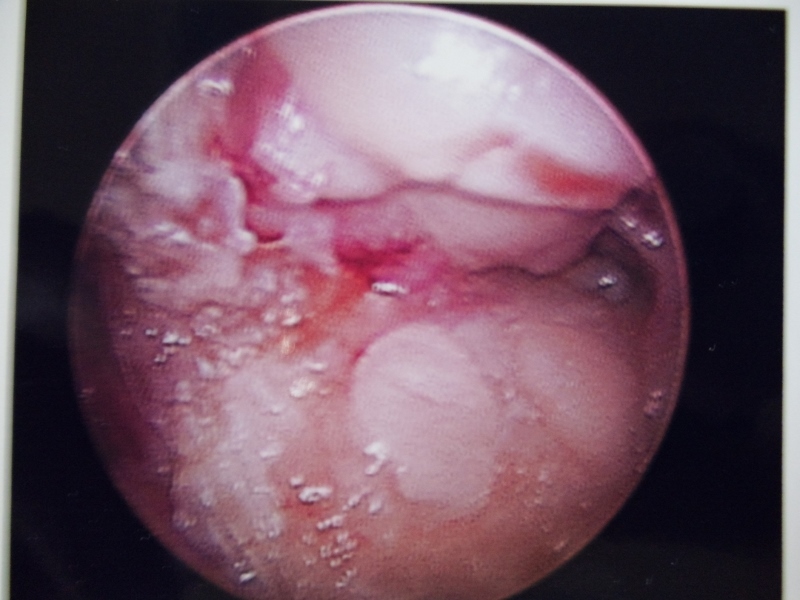 The soft tissue is repaired and immobilization for 3-6 weeks is necessary to allow the area to heal completely. The long-term prognosis is usually excellent. 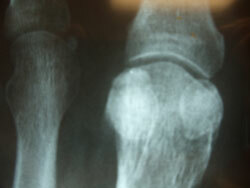 The fracture can be seen. Due to continued pain, a sesamoidectomy was performed. The bone is unhealthy and was removed. 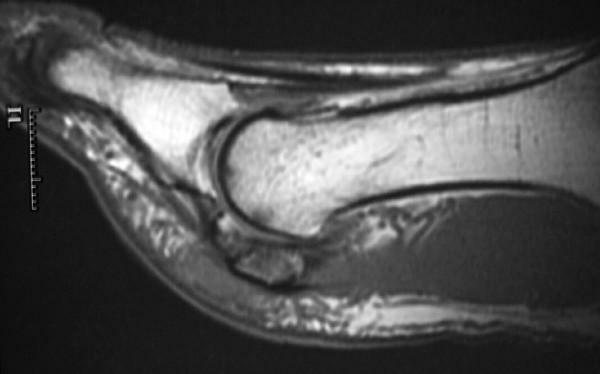 Xray and MRI of Synchondrosis Fracture to Sesamoid. 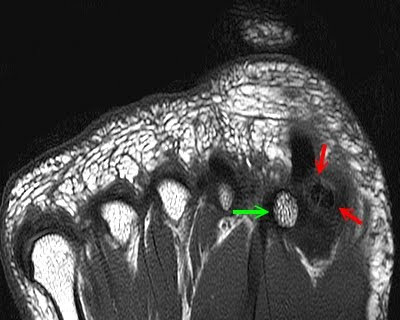 On the MRI (right), the bone is supposed to be black and the white is inflammation in the bone. Intraop pic of sesamoid fracture that didn't heal. 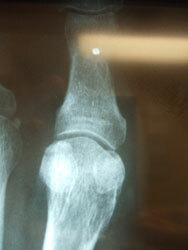 A portion of the sesamoid was removed. The remaining healthy part was left to allow the normal fulcrum of the flexor hallucis brevis. 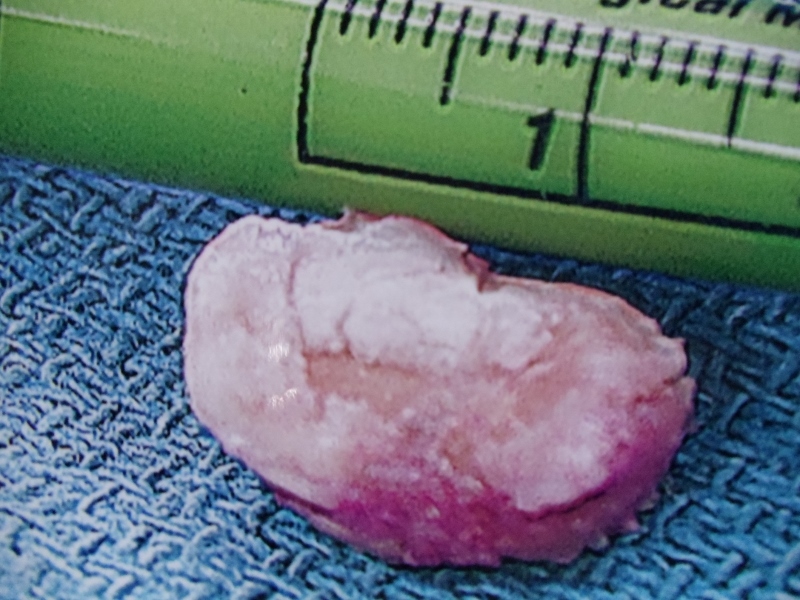 Avascular necrosis is an uncommon condition that can affect the bones of the foot or ankle. It is due to a loss of blood supply to the bone or a portion thereof. Loss of blood supply causes the death of the bone cells, which may predispose the bone and joint to collapse. The loss of blood supply to the bone is usually temporary. Over a period of time through a process called creeping substitution, the blood supply may return and the bone is partially revitalized. Although this condition can occur in any bone it is most common in the talus (small anklebone), navicular (part of the arch bones) or first metatarsal head (area of the bunion). Avascular necrosis of bones is usually due to a traumatic injury to the blood supply to the bone. It may also be seen in nontraumatic events such as in patients with chronic alcohol abuse or patients who have been on cortical steroids for a long period of time. Smoking also causes the problem to worsen. As avascular necrosis to the bone progresses a portion or all of the bone slowly dies. The early symptoms are stiffness and soreness in a joint or a deep ache inside the foot or ankle. Progressive loss of motion and stiffness are felt. If the disease advances the bone surface may collapse causing severe arthritis to the foot or ankle. Diagnosis of this condition is achieved utilizing MRIs. X-rays are usually negative in the early stages. The MRI will show the portion of the bone that has been affected and the severity of the problem. Bone scans can also be performed to evaluate the disease process. 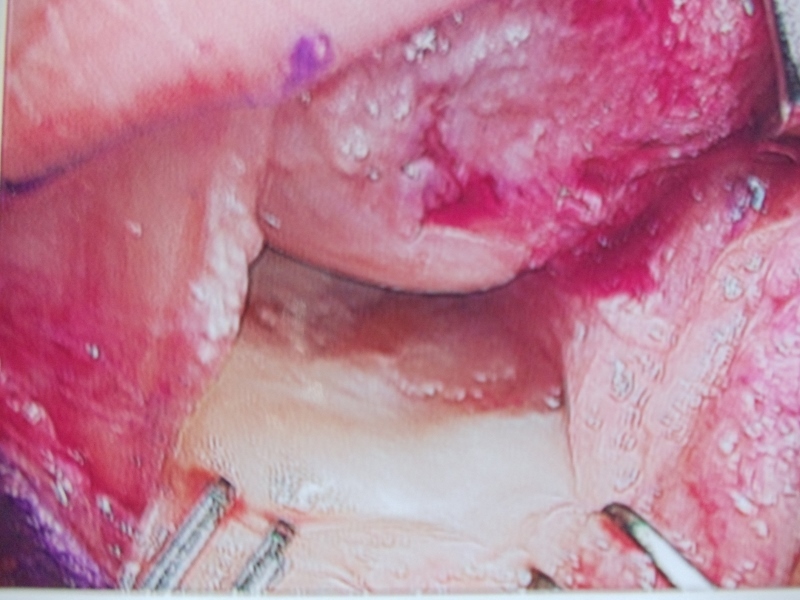 Treatment of avascular necrosis early on may help to prevent long-term problems. If weight-bearing bones have been affected relieving the stress to the bone until it revascularizes (gets new blood supply) is important to prevent the bone from collapsing. This will require a period of nonweightbearing using crutches. Occasionally decompressing the bone could help to alleviate some of the deep pain within the area and allow new blood supply to return. Removing some of the dead bone and packing it with healthy bone may also aid in the healing process. At times electrical stimulation to the bone will also help stimulate new bone formation. If the joint collapses procedures including joint replacements or fusions may be necessary to allow pain-free movement. Intraop pics of symptomatic sesamoid that was completely removed. 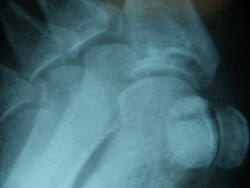 It is also an anatomic congenital variation to have extra sesamoids bones or ossicles at different parts of the foot. 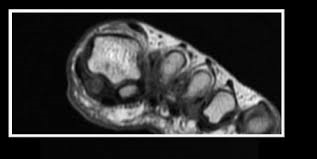 Specifically, there is are a pair of sesamoids that can appear underneath the 5th metatarsal base in a pair. Similarly, the force from a direct impact or a sharp movement to the area causes a pulled from soft tissue attachments can cause fractures to the ossicle(s). 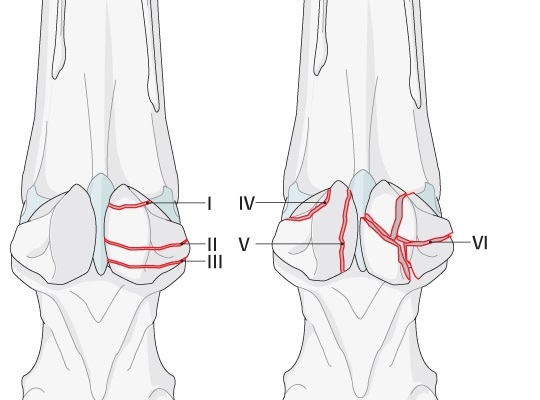 Treatment of these fracture is the same as for the sesmoids lying underneath the 1st Metatarsal involving a period of immobilization and offloading in order to allow the fracture to heal or to consolidate with a non-osseous union. There are also the cases where incomplete healing does not occur and the non-union becomes continuously painful and necessitates surgical removal.